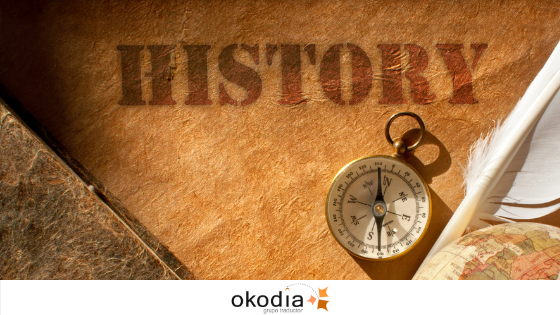 Many years ago, when the “wonderful” mobile applications with which we translate other languages to greater or less success weren’t even a thought, there were people who made it possible for people who spoke different languages to understand each other.These hard-working professionals were fluent in at least two languages and were the pioneers of the profession that the members of the Okodia- Grupo traductor team practice today.We’re talking about the first translators and interpreters:those long-forgotten historical figures without whose efforts none of us would be here today. Perhaps you’re aware that the terms “translator” and “interpreter” are not synonyms.In a nutshell, we could say that translators translate words in one language into another in writing while interpreters do so orally.It goes without saying that there’s a world of different between the two professions, such as the fact that interpreters have no time to review their translations whereas translators can re-read and review their work before submitting the project to the end client. To sum it up, they are two very different professions.But this article is not about this but instead about the history of the great Sacagawea. We’ll go back in time to the late 18th century and the early 19th century.Those tumultuous years are remembered in history as those dearest to the great settlers of new lands.One of the places preferred by these great men (because they were almost always men, what a coincidence!) was a wonderful and sprawling territory discovered by Christopher Columbus in 1492:America. One of the best-known expeditions of that time was led by two first-generation Americans:William Clark (1770-1838) and Meriwether Lewis (1774-1809).Do their surnames ring a bell?This is probably because they were the protagonists of the first and most important reconnaissance mission of the American Wild West. The American president at that time, Thomas Jefferson, sought to dominate each and every one of the territories of the new nation before his great enemies the British did.Jefferson commissioned many expeditions that he called the “Corps of Discovery”, but one of the most important—historically speaking—was the so-called “Clark and Lewis Expedition”. As we all know from Western movies, the lands in the Northern United States were inhabited by different Native American tribes belonging to different ethnic groups.One of the most important groups were called the Shoshones, a term derived from shishinowihs which means “snakes”.Even if the name doesn’t ring a bell, you’ll surely remember one of the tribes comprising it: the Comanches—the Indians known to movie enthusiasts all over the world. The protagonist of our story, Sacagawea, wasn’t born as part of the Comanche tribe but instead of the Agaidika (“salmon eater”) tribe.This tribe was known among the European explorers for being very friendly and was shunned by the other tribes for being overly complacent with the white invaders. Nicknamed Janey, Sacagawea was born in 1787 in the Lemhi River Valley, in the present-day State of Idaho.Sacagawea story before being part of the Lewis and Clark expedition is somewhat confusing but, apparently, during her childhood, she was captured by an enemy tribe and sold afterwards to an explorer, fur trader and well-known translator called Toussaint Charbonneau. Toussaint Charbonneau was Canadian of French origin descended from great settlers from the Old World.The pioneer Charbonneau made his living hunting and trading in furs on behalf of a famous British company called “Northwest Company”, but in his spare time he also earned some money by serving as a translator in the expeditions of settlers arriving to the territory.Legend has it that Charbonneau loved the Native American lifestyle and liked living among the tribes around him so much that after marrying a Native American beauty, he didn’t even think twice about buying young Sacagawea to become his second wife. The couple’s story was one of many and would not have been known outside the family had it not been for a coincidence.In November 1804, the explorers Lewis and Clark came to their village looking for translators and interpreters to help them understand the Native American tribes during their expedition to annex the remote regions of Louisiana and Oregon.Charbonneau was one of the translators chosen not only because he was fluent in several languages, but also because his second wife, little Sacagawea, spoke Shoshone. Sacagawea soon took all the spotlight away from her loquacious husband, not only because she was fluent in English, French and Shoshone but also because, together with her newborn son Jean Baptiste, she exuded such an image of peaceful intentions and good wishes that no ferocious Indians dared to put a stop to the advance of the white explorers.The result of her efforts? The success of the expedition.